One of the coolest and most confiding reptiles I’ve encountered in the tropics is the Striped Basilisk Lizard (Basiliscus vittatus). 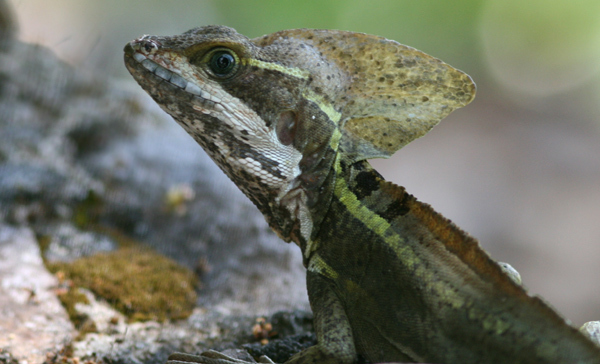 This remarkable little monster is also known as the Brown Basilisk, but it shares a more glamorous nickname and ability with other lizards in its genus. 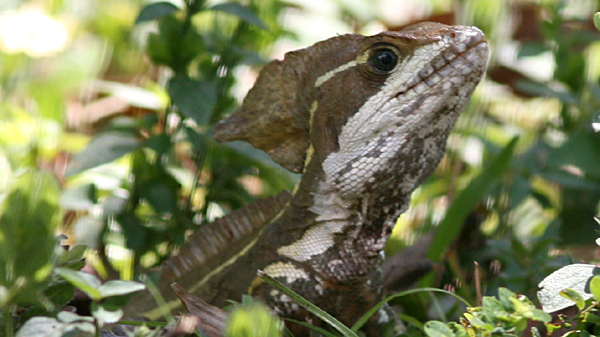 The genus Basiliscus, in the same family as iguanas, includes four species. Along with the striped basilisk are the Common Basilisk (B. basiliscus), Red-headed Basilisk (B. galeritus), and Plumed Basilisk (B. plumifrons). Basilisks collectively share the nickname “Jesus Lizard” or “Jesus Christ Lizard” because they can actually run on top of water. Large hind feet with flaps of skin between their toes help support the basilisk by creating a larger surface and a pocket of air. These traits combined with a speedy upright gait keep the lunging lizard from breaking the surface tension of the water until momentum slows and it resorts to mundane swimming. Smaller basilisks can run about 30 to 60 feet over water without sinking. This spectacular display is usually a response to perceived danger. While studies specific to striped basilisks are hard to come by, anyone interested in the three-dimensional hindlimb kinematics of water running in the plumed basilisk lizard could do worse than to check out this study. Better yet, check out this photo of one of these guys running on water! The striped basilisk can be found close to water throughout Central and South America. This species also appears as an introduced nonnative in Florida. These diurnal dragons run between 1 and 2 feet long, eat a varied diet, and employ a defense of standing stock still and counting on their coloration to camoflauge them, a defense that might be more effective were it not for the bold lemon stripe down each flank. Surprisingly, the striped basilisk is not endangered. But you forgot to mention that they can turn a person to stone with one look. Looks like a Reneacmeant of Batman! The “lipstick” on that one Basilisk I.D.’s it as a “Red Headed Basilisk”, some type of sub-species of the brown B., I believe. I saw these amazing lizards this week at the Ritz Carlton Resort in Naples, Florida. At first I thought they were iguanas but as I approached one, it ran away from me upright on its splayed back feet. I couldn’t beleive it! I saw a couple more in the mangrove area next to the Gulf of Mexico beach of the resort; one was eating an earthworm. I had to look them up becuase I’ve never seen a lizard like this before in Florida and I’ve lived here for more than 30 years. (I live on the east coast near Cape Canaveral, but lived in Miami years ago so know about exotics adapting to the wild.) It was deja vu of Jurassic Park: the comfreys! The striped basiliks obviously have immigrated to (and have been freed in) south Florida, and are doing so well that they can stay at the Ritz! I just found one of these Basilisk Lizards in my back yard in Davie, FL! I had to look it up on the internet to see what it was for sure! Thank you for your website to clearify it for me. This was so cool to find it right outside my own door! My dog chased it into the bushes and it ran back out next to my pool, then when she chased it again it dived into my pool! That’s when I knew it was something special. Thank you for the information. I look forward to watching it in my yard for a long time to come! What the heck do Plataeu Striped Whiptail eat, and how do we raise one? Also we usually dont raise lizards, but its tail is bleeding and we weren’t sure if it was hurt or if it is normal. Just sharing that I found a Striped Basilisk in Naples, FL this morning and could only identify by finding the image on this site. I recently found several Cuban Anoles so it seems we are being invaded by the large lizards. It is actually neat to see this in the wild. I live in Miami (Coral Gables) & noticed 2 little ones in my back yard about 2 years back. I feed them every now & then different things when ever i see them on my deck. One is a dark brown color with the yellow stripe, the other a light brownish green color with diamond patterns on his back, also with the yellow stripe. They really seem to enjoy regular sliced bread broken up in pieces of course… These 2 have grown & are well over a foot long. About a week ago though, I went out back & found the larger one dead in my pool. I’m not sure what couldve happened considering they run on water (which ive seen on few occasions) but this one drowned. 🙁 Over the past few months though, I’ve seen a lot of smaller ones all over our yard as well as a few other rather large iguanas and other unusual lizards. These lizards are really cool to watch especially when they go to run, because they stand up and run on only 2 legs. Makes me laugh every time! So, these guys have been thriving at the Naples, FL Ritz for at least a couple of years, I see. I live just a few blocks away and had never seen one until yesterday. My son and I were biking the sidewalk/path from the Ritz to Pelican Bay Park, when one of these guys darted in front of us and took refuge in a bush. His stripes helped us to find and study him. He was about 15 inches long and beautiful. I live in Deerfield Beach Florida and have a lot of flowers and foliage around the back of my house. I have been seeing the beautiful large bright green cuban anoles around for the last few years. I am always thrilled when I see one and have gotten some great pictures. But in `the last few months I have seen the striped basilisk lounging on a stone bench and my wicker furniture. I went online and finally figured out what I was seeing. One time when he ran away I noticed his unusual gait running very fast on his back feet. I feel bad because I am sure he is looking for a mate and because they are so rare I am wondering if he will find one. I loved the story of the man who picked one up and brought it inside to watch television. Wish I could get mine to do that!!!! !